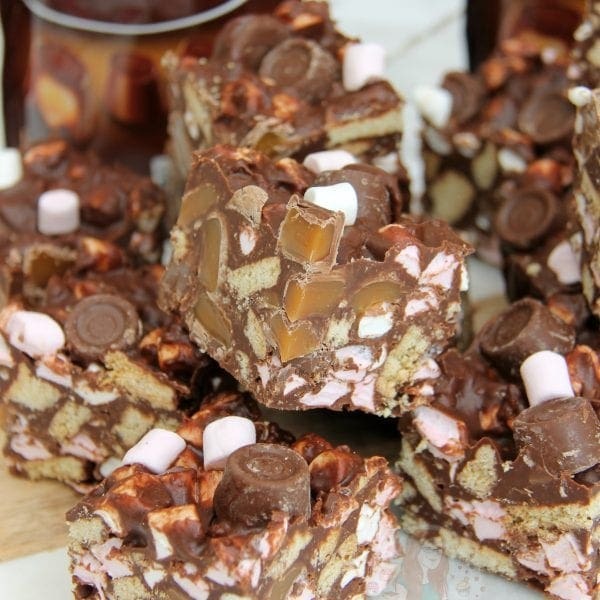 An Easy No-Bake Chocolate Traybake with Marshmallows, Digestives, and Rolos making the BEST Rolo Rocky Road. This is obviously a bit of a sweet treat, but to be honest, I love it that way. 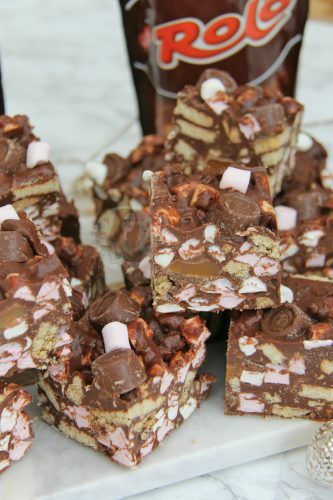 You have Chocolate, Syrup and Rolo’s and more… but its worth it. You can cut the pieces into smaller ones if you’re worried but to be honest, you will still get a second piece seconds later. I still used Digestives in this one because I wanted the crunch, and a bit of a biscuity flavour, and it was dreamy. My most popular recipe by far on my blog is my No-Bake Caramel Rolo Cheesecake and I can see this one going a little crazy as well. Any Rolo themed seems to be popular on line, but I know some of you who read my blog can’t access Rolos which I find a little upsetting for you! 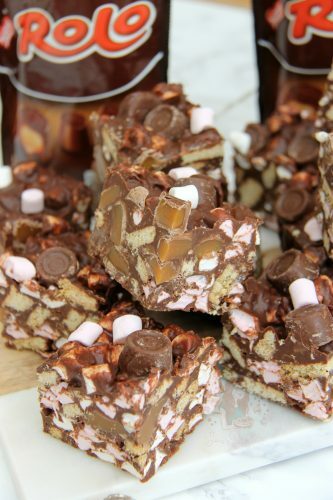 You can use other caramel sweets such as Cadburys Caramel, or Galaxy Caramel, or anything else! I just adore a Rolo. I’ve tried it several ways, but the combination of the Dark and Milk is a winner for me. Its entirely up to you. I used a supermarket own one when I made this, and it worked a treat. I do love using good quality chocolate, but in the run up to Christmas I’m saving my costs a bit and using cheaper, and it still tastes amazing. I swap between branded and supermarket own ingredients for all different sorts of ingredients such as the chocolate, the butter, and the biscuits. Anything thats on offer and cheaper is best as long as it still tastes nice! In a Large pan, add the Golden Syrup and Butter – melt on a low heat till combined and smooth. Add in the chocolate (chopped) off the heat, and stir till smooth. Once its melted and combined, leave to cool for a couple of minutes. 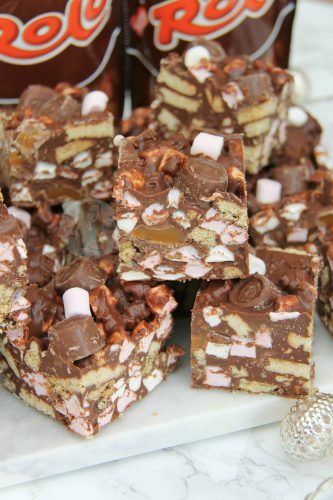 In a large bowl, add in the Marshmallows, chopped biscuits, and 2 of the bags of Rolos and mix briefly. 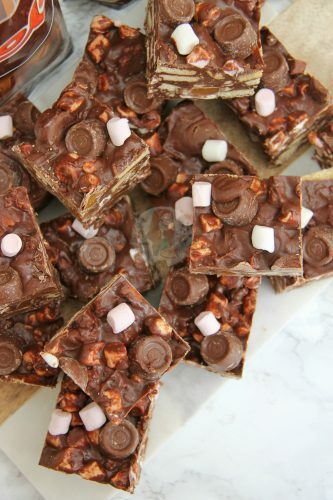 Pour over the chocolate mix and fold together – pour into the tin and spread till its even. With the third bag of Rolos, place them on the top and press in to decorate! 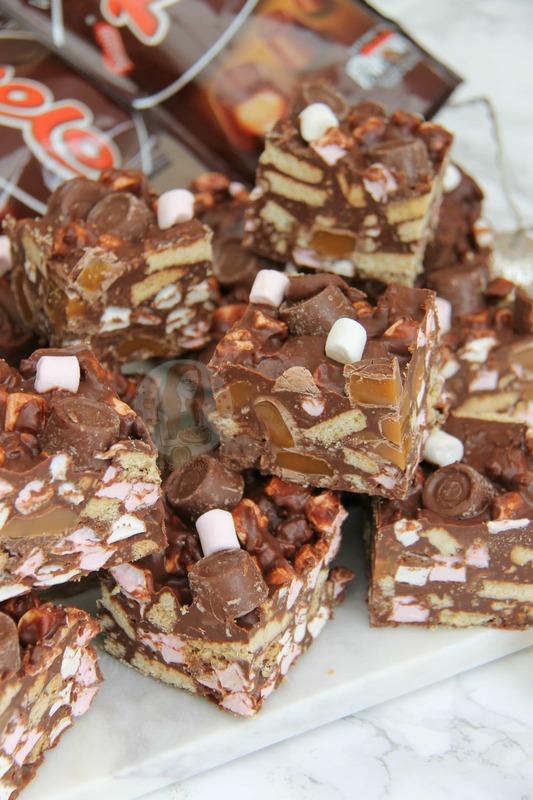 I personally used Milk and Dark chocolate in this because of the sweetness. To make it less sweet, use entirely dark, or use entirely Milk if you prefer. This lasts best in the fridge if its a hot day, or on the side if its cold. Place in an airtight container/tin for storage! If you have troubles with the mixture splitting in the beginning, its probably the heat thats doing it. Try and keep the heat as low as possible and be careful to not mix like crazy! 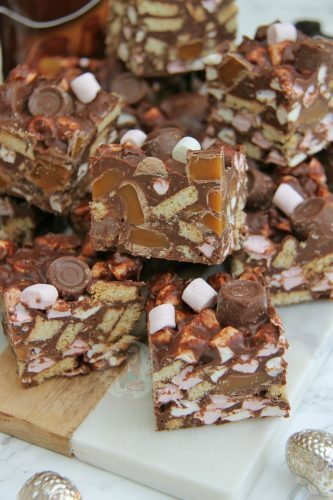 Find my other Traybake & Chocolate Recipes on my Recipes Page! Older Next post: Chatting about Anxiety. 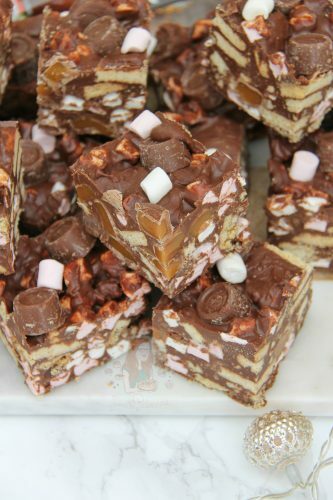 Hi, this looks wonderful, would it work as a chocolate biscuit cake, ? Looking for a chocolate biscuit cake to use as a layer in a tiered birthday cake.